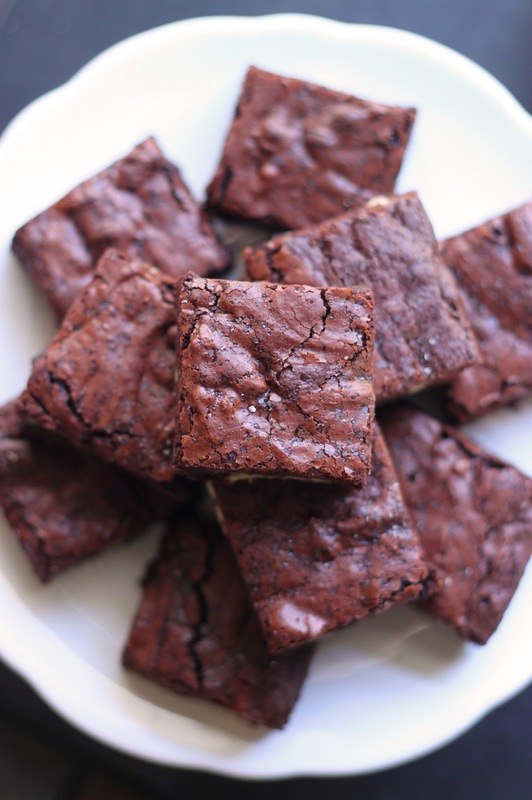 The Cilantropist: Cocoa Brownies with Browned Butter... Best-Ever Brownies? 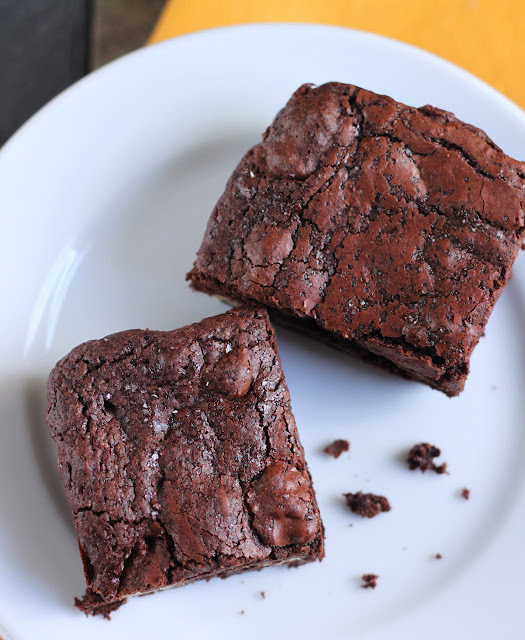 Cocoa Brownies with Browned Butter... Best-Ever Brownies? If it is possible to hate a particular dessert, I could easily say that I loathe dry brownies. They lure you in with the promise of chewy chocolate and a tight, dense crumb, only to leave you disappointed with a brown mass that seems to immediately fall to pieces when you bite into it. Come on brownie, lets get a little resilience here. Now I realize that some of you might condemn me for detesting any dessert with almighty chocolate as the main ingredient, but at the risk of prompting shouts of sacrilege, I will say it again: To me, a dry brownie is not even worth one single bite. Because I hold this opinion, brownies in general don't rank high on my list of favorite chocolate desserts, or high on my list of desserts in general; however, when I opened my mailbox a few months ago to find the February issue of Bon Appetit, I was immediately awestruck by the gorgeous dark chocolate brownies gracing the cover. The visual alone set off immediate chocolate cravings, but then Bon Appetit piqued my interest even more with the huge text proclamining "BEST-EVER BROWNIES." Wow Bon Appetit, that is a pretty bold statement to make. 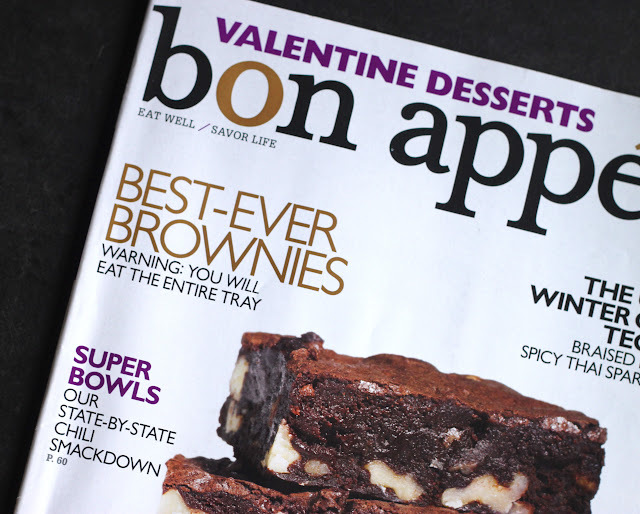 Both the delectable photo and the 'best-ever' proclamation broke down my initial brownie barriers, so it was only natural that I check out the recipe - and that was where Bon Appetit upped the ante even more. You see, they had an entire feature section devoted to chocolate desserts penned by none other than the lovely Alice Medrich. For those of you not familiar, Alice is an author, baker, and chocolatier that has been affectionately called 'The First Lady of Chocolate.' Is it not appropriate then, that a recipe by her should be deemed 'Best-Ever Brownies?' As if I wasn't convinced enough already, I scanned over the recipe and realized that these brownies were a one-pot recipe. Done. I was sold. The only real difference between her original Best Cocoa Brownies and these Cocoa Brownies with Browned Butter and Walnuts is the browned butter. Browned butter bits at the bottom of the pan. For those of you new to browning butter, it is essentially the process of cooking butter until the milk solids and any salt precipitates out and browns. After cooking, the liquid will be a lovely honey color, there will be browned bits at the bottom of the pan, and the butter will smell toasty and nutty. 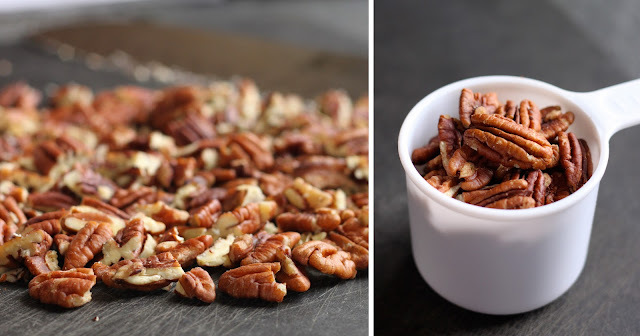 I think the browned butter, combined with the natural nuttiness of pecans, gives the brownies a more rich flavor and enhances the savory notes. Since I like all my chocolate with a little extra salt, the only real addition I made to her recipe was to add more salt to the brownie batter and to sprinkle a bit over the top before baking. Maybe. I can't quite decide, which might mean they didn't win the best-ever title. However, they definitely were 'Pretty-Damn-Good.' They were thick and fudgy, they had a super shiny, crackly top, and the salt made me over the moon. No where was the brownie even the slightest bit dry (not even at those pesky edges of the brownies!) and I think even the most discerning chocolate connoisseur would agree the rich chocolate taste was spot on. Taste and texture aside, I was almost convinced to call this recipe best-ever simply because it can be made in one pot and one pot only. Maybe these would be my best brownies ever if I had omitted the nuts altogether; I am not really a nuts-in-my-brownies kind of gal, so that might have soured me a bit. And honestly, labeling a recipe as the best brownie ever is really a tricky thing to do. But if you really twist my arm, I might, just might call these the best-ever brownies. Maybe in a moment of weakness. I can say that these Cocoa Brownies with Browned Butter have elevated brownies in my eyes. Now suddenly I am finding myself craving brownies all the time... Make them, you will see what I mean. Bake for about 30 minutes or more, or until a toothpick inserted in the center comes out almost clean - if there is still a tiny bit of moist batter at the very bottom that is ok. Remove the brownies from the oven and cool completely on a cooling rack. Once cool, remove the brownies from the pan using the aluminum foil overhangs; then pull the aluminum foil away from the brownies and cut them into 16 square pieces. Serve immediately or store in an airtight container. Have you seen the America's Test Kitchen version of brownies? They tried to make a recipe greater than the box mix (not that the box mix is great, but when you do a blind taste-test, most people will chose a boxed mix brownie over a homemade one). I hate dry, cakey Brownies too. The moist and fudgy kind is far better. Your look fantastic! Brown butter is so fragrant. I just adore Alice Medrich, she's pure genious when it comes to chocolate. I've made her cocoa brownies before and they are really dark and rich. I think I would omit the nuts here too, I find they get in the way when I'm eating brownies, I like my chocolate straight up! Gorgeous brownies- this one is sure on my list! the hummingbird bakery brownies are gorgeous too! I made these immediately after getting the issue...and I've made her original recipe, too! Gorgeous photos!!! I'm like you, I'm always hesitant about brownies because I like them to be very chocolatey and moist so I don't often make them since I've been disappointed in the past, but I'll have to give these a go! I swear these brownies got more traction on the web than any other Bon Appetit recipe -- and with good reason! I remember when I got this issue I posted on Twitter about them, asking if anyone had made them. A ton of people commented back. They must be amazing! I can't believe I haven't made them yet! These look incredible. 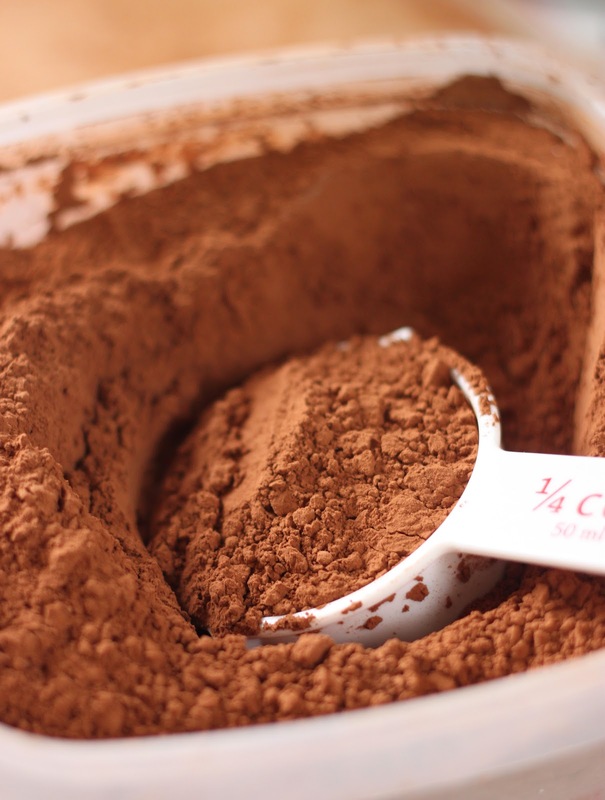 I'm generally not picky when chocolate is involved but love the idea of using browned butter. Even if they're not "the best," I look forward to giving these a try! 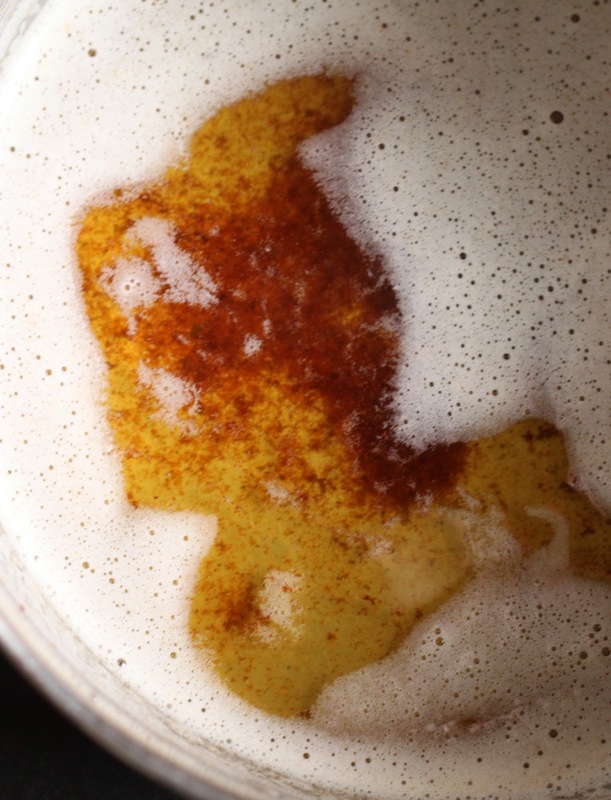 Love the photo of the browned butter! I happen to be a fan of the chewy edges of brownies, which works out well for me because most people don't want the edges! I'm a huge brownie person, but what caught my eye was the browned butter. Browned butter is a beautiful thing and I am definitely going to have to try it in brownies. The brownies look absolutely wonderful. Dry brownies are the worst! Why bother?? These look great...love the brown butter in them. Pretty Damn Good Brownies is a funnier recipe title anyway! O.K. These are on my to-do list now. I love browned butter, and have used it in other baked goods - just not brownies. I don't know why though, it's a great idea! These look freaking amazing!!! Browned butter makes everything better! The cocoa powder and browned butter in your brownies is definitely intriguing. I'm going to give it a go. Thanks for sharing! I've been seeing more and more recipes with brown butter. 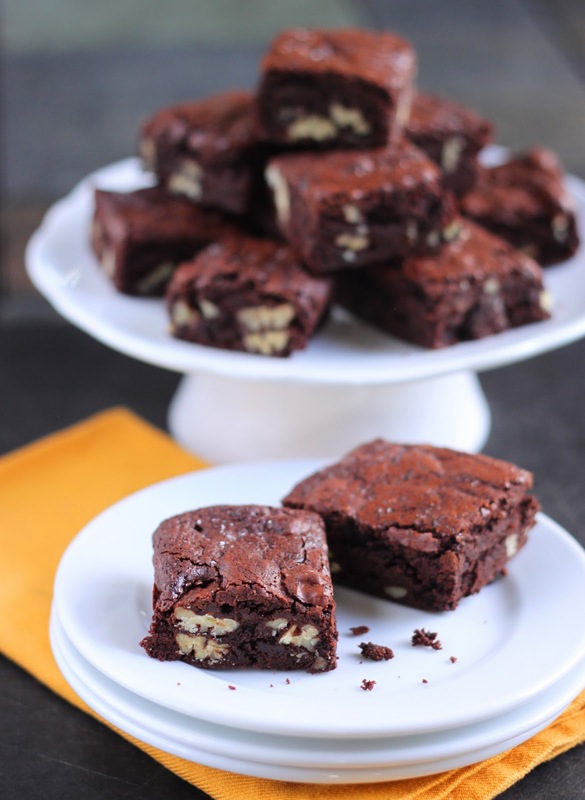 I guess I need to give it a try, because these brownies look super scrumptious!! I'm not a nuts-in-brownies person either. I think it's because my mother never put them in chocolate chip cookies when we were growing up, so therefor I don't really like them in any desserts unless it's a turtle cheesecake or something the like. I always think I'm not picky, but I suppose I do have my "things" that I'm picky about, like nuts! They look totally fantastic. A brownie recipe from you is a brownie recipe I'll trust! When I was a teenager, I was having a birthday party or some such thing. My best friend brought over a pan of brownies. We were all happy, because, well, brownies! Two guys bit into the brownies at the same time, chewed, stopped, looked at eachother, and started laughing. My friend said, "What? What is it? Why are they funny??" And then it dawned on her that she hadn't put any eggs or milk or something in, which made them basically explode into powder in your mouth. Your dry brownie thing made me think of that. I completely agree with you! Dry brownies are the absolute worst. These look amazing! Browning butter adds such a wonderful flavor. I just made cupcakes that have a brown-butter icing. amazing! Will have to try these-maybe with instant espresso powder? They might not even need it though! yumm!! I am not fond of brownies either. But these do look heavenly and I love the idea of using brown butter here. We use ghee (clarified butter) so much in our Indian cooking and love the flavor. the photograph of the powder is AWESOME! I MUST make these for my next posting!!!! I seriously heart brown butter. Can't wait to try these, they look glorious. I'm with you - no dry brownies for me. Supreme yuck! These look exactly like I would like them - and I'd go without the nuts, too. I'm intrigued by that addition of browned butter...I always love that layer of flavor that it gives. Mmmm! I just made these last week! I thought they were pretty dang good too! I just made them, their baking in the oven as type. If this happens to you DON'T WORRY after adding the eggs the batter became smooth and looked just like brownie batter should look like! They smell delicious, I can't wait to bring these with me to work tomorrow! THANKS!! Oh I was sucked in by the best-ever brownies too...and by the fact that they recipe was from Alice Medrich. I loooooved the addition of browned butter. I knixed the nuts and added orange zest instead which was a huge hit around here. Great post, and lovely photos! I mean I love the brownies for their chocolate, but to combine with with browned butter. I think I might be in heaven. I'm sold, too. Mr. Rosemary is quite particular about brownies and makes the most awful face if he encounters a speck of dryness. These are on the short list to make, after Lent, that is. Nothing like a good, rich brownie. Lovely job. Brown butter? I'm sold! These look incredible! Just finished making these--I omitted the extra salt on top (not much of a salt-with-my chocolate girl), but liked the pungent, savory kick with these chocolates--more than makes up for the lack of solid chocolate, and makes the recipe unique! Definitely a fan. Ooo too much deliciousness for me this early in the morning. These look to die for. Seriously...amazing. Browned butter is heavenly with chocolate. Brownies are probably my absolute favorite chocolate treat. But I totally agree with you, a bad brownie doesn't deserve my attention. These sound great, I can only imagine the flavor twist the browned butter gives them. Wow, these sound out of this world! As if I needed to be convinced to eat a brownie - I must try the best brownie ever! girl, how could you not love be a love of brownies! they're about one of the best choco desserts out there. i'm so glad the BA cover has started to change your mind! Haha! Yay, we both made the same brownies recently! Great minds think alike, no? ;) They were soo yummy! I made these for a ski trip to Breckenridge, CO for 10 people so I doubled the recipe and baked in a 9x13 pan. I found the baking time best at 34-35 minutes. Found it a little difficult to know when the "butter had browned" as I am a novice baker - but still turned out delicious! I ended up repeating the recipe again 1 week later for a dinner party! Amanda! I have that same issue and those brownies have been screaming to be baked. I think I need to just give in, bake them, devour them and get it out of my system! Great photos and it was great hanging out with you this weekend! 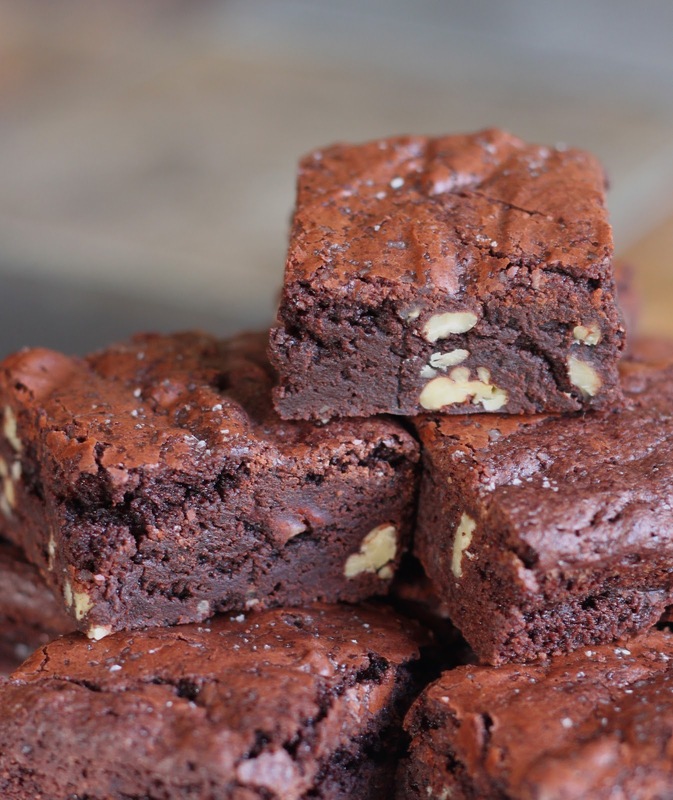 These brownies look incredible - so rich and chewy. Where's the milk! نقوم على التخلص من النمل الأبيض والنمل الأسود حيث نعمل على رش المبيدات الحشرية والادوية التي تتخلص من النمل في أسرع وقت ممكن بجانب إلى اننا نقوم على تطيهر المكان وتنظيفه بشكل جيد مع القيام بدوريات دائمة للتأكد من إزالته.